The black stone used for this carving by Haida artist Charles Edensaw is argillite, a carbonaceous kaolinite shale. Truly unique, this sedimentary rock is found in only one place in the world: Haida Gwaii. Formerly known as the Queen Charlotte Islands, the archipelago in British Columbia is home to this very special material and the similarly distinct Haida artistic traditions that have arisen from it. More specifically, argillite comes from the Slatechuck Mountain. And while Haida peoples have accessed the Slatechuck quarry and produced such argillite carvings for centuries, it was not until 1941 that the quarry site (measuring approximately 18 hectares) was officially designated as land belonging to the Skidegate band, assuring that access would remain theirs in perpetuity. For those who might not identify as geologists, or even amateur geologists, the slate’s black color comes from its high levels of carbon. A kaolinite shale, it is composed of clay material that has been subjected to heat and pressure over geologic time, resulting in a highly uniform and workable rock. For example, it ranks at two and a half on the Moh’s scale of mineral hardness (on a scale of one to 10, with 10 being diamond-hard). 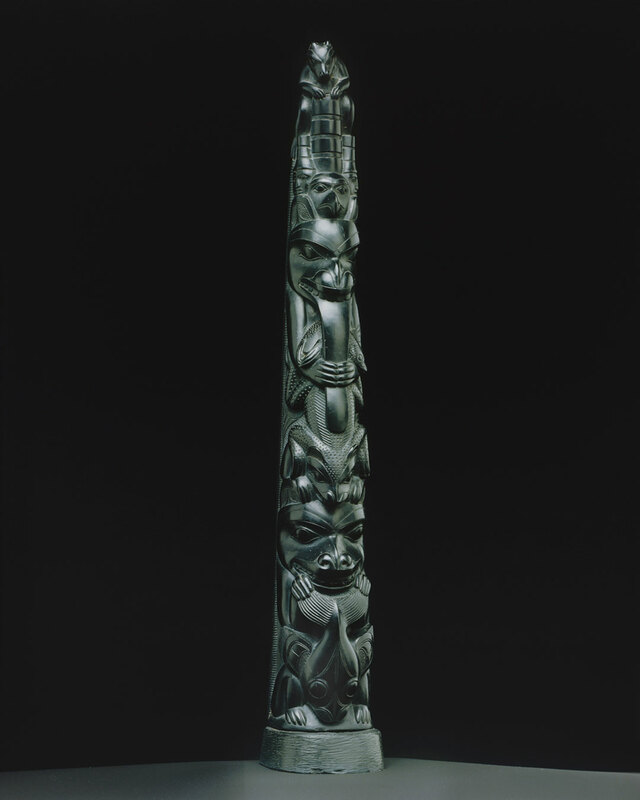 Measuring 19 inches tall, this model totem pole (qwa.a gyaa.angaa) was expertly carved out of one piece of argillite. Perhaps it goes without saying, but the larger the carving, the more difficult it is to do successfully, as natural imperfections in the shale grain can result in fine fractures. Further, argillite is sensitive to its environmental surroundings, and can absorb and desorb moisture quickly; it is essential that freshly quarried argillite is slowly and carefully dried, otherwise it is prone to cracking. Currently on view in the third floor Native Art of the Americas galleries, this piece makes clear just how skilled and masterful Edensaw was as a Haida carver. The figures on the pole from top to bottom are: a bear holding five stacked cylinders—representing a ringed basketry hat—above an eagle’s head; two human heads on either side, also wearing ringed hats; a bear, holding its tongue; and another bear, holding a seal-like figure with a fish-like tail. Though quite a lot to fit into 19 inches, compositionally, each animal and human figure bears exquisite incising and detail. Such model poles were primarily made for commercial sale as Haida contact with Americans and Europeans increased during the 1800s. In fact, around the time that this piece was made (circa 1885), argillite carving experienced a surge in output corresponding with an exploration of new forms. As traditional Haida ceremonial objects and practices were increasingly banned by the Canadian government, new forms of creative expression thus emerged. Edensaw was an important figure during this period, whose personal style influenced many other Haida artists living in Skidegate and Masset. With a deeper understanding of argillite’s geological properties, rarity, and cultural significance, this carving by Edensaw is all the more impressive. “Haida Argillite,” Simon Fraser University, Museum of Archaeology & Ethnology, accessed July 11, 2018, https://www.sfu.ca/archaeology/museum/exhibits/virtual-exhibits/haida-argillite.html. “Care of Argillite,” Government of Canada, accessed July 10, 2018, https://www.canada.ca/en/conservation-institute/services/conservation-preservation-publications/canadian-conservation-institute-notes/care-argillite.html. Peter L. Macnair and Alan L. Hoover, The Magic Leaves: A History of Argillite Carving (Victoria, B.C. : British Columbia Provincial Museum, 1984), 17.